Firenzo woodfires are fully guaranteed against defects in materials and workmanship for a periood of TEN years (*FIVE years for Coaster) from date of purchase for the steel firebox, top castings, cast door and insert fascias. All other parts e.g. metal doors, kiln bricks, door glass, seals, air supply components, paint finishes, hot water heaters etc. are covered for ONE year. 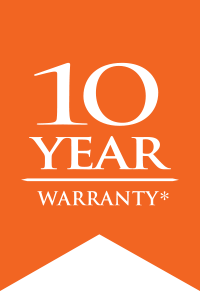 This warranty does not apply if the woodfire is incorrectly installed, tampered, abused or neglected during normal domestic use and also excludes normal wear and tear. We guarantee to repair or replace defective parts at the discretion of the manufacturer, Hewitsons Limited, with no cost to the purchaser.